Latex sounds like it might be a toxic chemical, but latex mattresses have, in fact, been popular in the last decade thanks to its natural properties. Turns out, it’s sustainably sourced from the sap of a tree--and it makes a great mattress! Thanks to innovations in the mattress market as well as in mattress product, latex mattresses are more comfortable and affordable than ever before. Below, we’ve rounded up the top five latex mattresses. The mattress industry is notoriously gimmicky, but that’s why we’re presenting the following ratings--to help you sift fact from fiction and determine what’s worth paying for and what’s not. We’ve reviewed everything from customer testimonials to in-home video reviews to pressure mapping on the mattresses featured below to help you make a decision you feel good about. Don’t forget to check out the buyer’s guide at the end! Factory Direct, CertiPur Certified Foams - no chemical fire barrier means better value and better for you. The Hybrid Latex mattress from Nest Bedding offers a uniquely customized latex layer paired with an individually pocketed innerspring mattress for a great blend of comfort and affordability. Nest Bedding wraps its foam and coil layers in a durable, organic cotton cover that zips and unzips. Inside this cotton cover is a removable latex layer that can be swapped out. Since Nest Bedding is online only, this allows you to inexpensively and easily adjust the comfort of your bed. Your initial order will include the firmness you select (3 inches of aerated foam in soft, medium, or firm), but thanks to Nest Bedding’s comfort guarantee, you’ll have up to 100 nights to swap out your layer for a softer or firmer layer. In addition to the latex foam layer, your mattress will also have a foam transition layer, an eight-inch, quantum edge to edge innerspring coil layer, and a one-inch base foam layer. The quantum edge coil means that your coils will cover the entire bed, providing great edge support and durability. Plus, the coils are individually pocketed, so you’ll enjoy the bouncy feel of a coil bed and ease of movement on the bed, without the motion transfer that a single wire bed would create. Thanks to the combination of coils and latex, the Hybrid from Nest Bedding isn’t as stiff as some latex beds, making it a great choice even for side sleepers. This bed also responds to pressure mapping very well, with few pressure points to cause issues. ​The Green Latex mattress from Avocado is beautifully crafted, with details like hand-tufting that are normally found in much more expensive mattresses. Thanks to the company’s direct-to-consumer model, it’s able to provide an eco-conscious, toxin-free experience at a terrific value. The standard mattress (there are vegan and pillowtop options available, which is great) is eleven inches thick and utilizes two latex layers: a two-inch comfort layer and a one-inch core. Each layer is hand-tufted, which means it’s free of glues or laminates. The coil layer is eight inches thick and features as many as 1,414 individually-wrapped coils. Avocado uses recycled steel for its coils, reinforces the perimeter, and arranges them all in three zones to provide optimal contouring and joint support. Plus, it means every edge of the bed is useable. The Avocado latex hybrid has a long, long list of certifications (such as the Greenguard Gold Certification) that speak to its freedom from chemicals, VOCs, and more. Natural latex mattress $1,000 less than other retailers! Free Shipping! Made in U.S.A.! ​​Hybrid latex mattresses combine many great features into one relatively affordable mattress, but for those who want a latex mattress, through-and-through, our pick is the Spindle Natural Latex Mattress. It works a little differently than traditional mattresses, as it comes in three separate latex layers in three separate boxes. The layers are soft, medium, or firm, depending on your preferences (the medium latex mattress, for example, comes with two medium layers and a firm, which can all be rearranged as needed). Since latex is extremely heavy, this unique method of mattress building allows you to easily dismantle the layers later for moving, which is an added plus. Spindle also offers a remarkable 365-day comfort guarantee, promising to help you get a mattress that feels great for you. In addition to the areated latex layers (which are clearly marked so you know which way is up) which stick together nicely, the Spindle mattress also includes an organic cotton cover that zips. The cover’s circular knit helps to maintain the unique latex feel of the bed, and the cotton is grown and sourced in New Mexico, Texas, or India. Spindle utilizes the all-natural, continuous pour Dunlop method for its latex mattresses, which means you’re getting a chemical-free experience. Plus, we find the bed has excellent motion reduction (not quite as good as memory foam but much better than innerspring mattresses) as well as tremendous edge support and great bounce. Spindle also prides itself on being affordable--costing about $1,000 than comparable latex mattresses. Plus, you’ll have the added comfort of knowing that your all-latex mattress will last at least five or ten years longer than traditional foam mattresses. Here’s the one thing we don’t like about the Spindle (and why we docked it half a star): the company explains that their latex beds aren’t good fits for people with a BMI (body mass index) over 31--which can be as little as 150lbs. for women or 180lbs. for men. We feel this will rule out a lot of potential customers. ​​Saatva is a mattress brand known for its luxurious feel and high quality, and the company’s turned its attention now to the best latex mattress market with the Zenhaven. Utilizing a clever dual-sided approach to finding the perfect comfort level, the mattress is through-and-through American Talalay latex. The latex cores are designed in five different zones so that they provide additional spine alignment and comfort at pressure points. All of it is wrapped in an organic New Zealand wool that provides breathability, temperature regulation, and moisture-wicking properties; it also acts as a flame retardant. The Zenhaven’s approach to firmness, as we mentioned, is clever: one side is what’s considered “luxury plush” while the other side is “gentle firm.” If you don’t like one side, you can flip to the other side. At $1,299 for a twin, however, the Zenhaven is more at traditional best latex mattress prices--especially considering the fact that it utilizes Talalay latex and not Dunlop. ​In a lineup of latex mattresses, the Cedar Mattress from Brentwood Home quickly rises to the top, thanks to its fantastic construction. The only thing that doesn’t stand out? 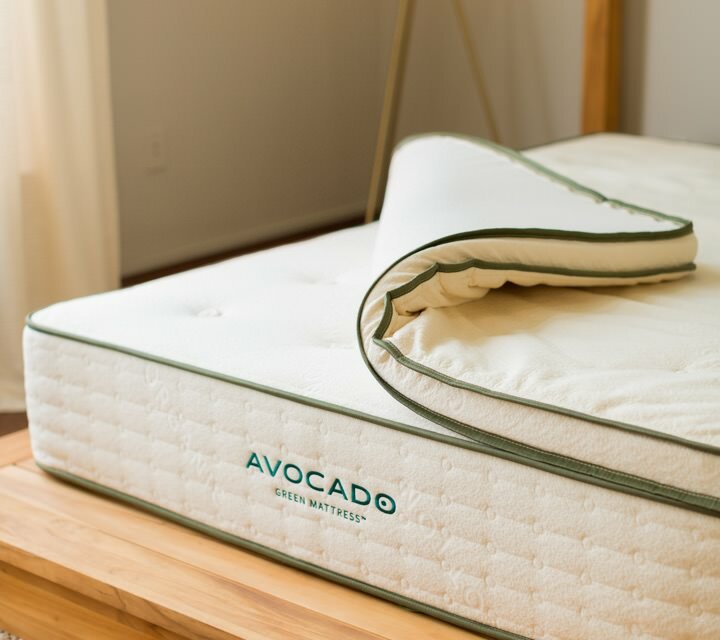 The price; the Avocado Mattress latex hybrid is constructed almost identically but is cheaper. Despite a solid four inches of latex, this bed feels surprisingly soft and bouncy. Edge support is terrific, as is motion isolation. This is not a cheap bed (a twin starts at $1,349), but given the better-than-average construction, durability, and eco-conscious, non-toxic support, this bed manages to be a terrific value. Works on all surfaces--adjustable, slats, flat, box springs, etc. Latex is nothing new--in fact, latex mattresses have been around since the 1920s. The original process (the Dunlop process) essentially bakes the sap harvested from the rubber tree into a foam. Traditionally, the Dunlop process creates an uneven finish, but it’s prized for its organic, all-natural properties. It’s also extremely durable and it’s biodegradable. A latex mattress feels similar to a memory foam mattress, but different. While memory foam is made with harsh chemicals and tends to hang on to heat, contouring the body but making it more difficult to move, latex creates more push-back and is not so hot. A common option today is to combine latex layers with a spring foundation, creating a hybrid mattress. This both brings down the weight of the mattress as well as its price without impacting durability or comfort significantly. Many people also prefer the more traditionally bouncy feeling of a hybrid. The beds we’ve included above offer great combinations of value and quality of construction, along with innovative solutions for comfort and firmness. It’s not difficult to find a comfort level that suits you. What you should pay significant attention to, however, are the warranties and trial-periods. While latex is long-lasting, it’s worth questioning if the mattress company won’t back up its product with a long warranty (it should last at least ten years). We also feel that the longer the trial period, the better. Since you’re not trying your bed first, it’s important to purchase with a company that offers remuneration if your bed won’t work for you. Latex will last much longer than your coil bed and it performs better than memory foam when it comes to temperature regulation, and its all-natural properties make it an ideal choice for health-conscious individuals. If can afford the initial investment, it’s a choice that will pay off in the long run. Sweet dreams!